Garrett McNamara, big-wave surfer who holds the Guinness World Record for largest wave ever surfed, may have broken his own record. 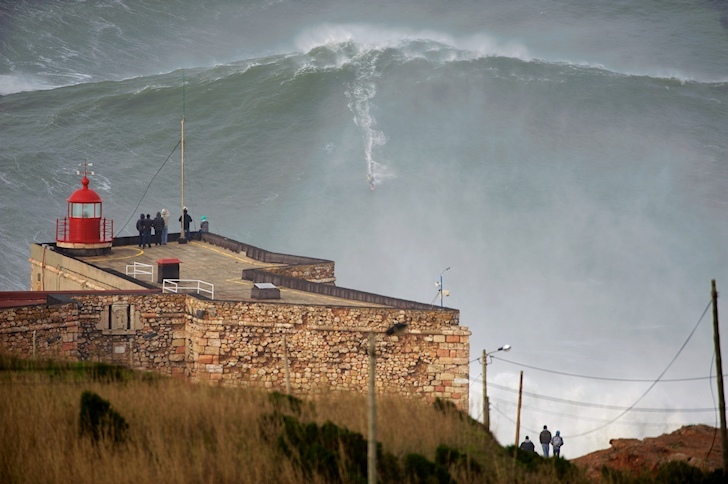 Garret arrived in Nazaré, Portugal, following a massive swell caused by a North Atlantic storm measured at 930 millibars, for reference Hurricane Sandy was measured at 940 millibars. 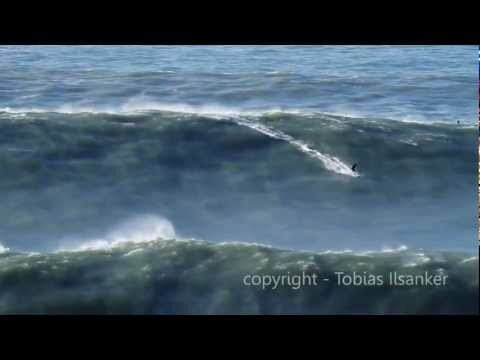 The image was captured by Tó Mané, a well respected European surf photographer. Update: Video has arrived. Incredible. Shannon Aston is a lecturer, photographer and surfer living in South Korea and for 2 years has been working on a piece documenting the surf community along the 38th Parallel, an area along The Military Demarcation Line separating North and South Korea. It was demilitarized on July 27th, 1953 after the end of the Korean War and is still patrolled by North and South Korean troops. As well as being one of the most militarily tense places on Earth, the surf is some of the best and consistent in South Korea. Minus 15.3-degree-Celsius temperatures in the Shandong Provence of China have frozen bays and harbors, stranding nearly 1,000 boats in Bohai Bay, Liaoning provence, reports say. 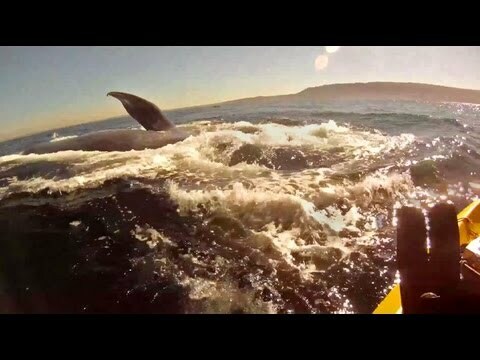 Kayaking off Redondo Beach in southern California, this youtube poster got the bright idea to chase a blue whale and jump in to swim with it. Can’t say I wouldn’t have done the same. The Criterion Collection has a 3 DVD collection from French film maker, Jean Painlevé on sale. It has 23 psychedelic shorts about aquatic life, eight of which are scored by Yo La Tengo! The mesmerizing, utterly unclassifiable science films of Jean Painlevé (1902-89) have to be seen to be believed: delightful, surrealist-influenced dream works that are also serious science. The French filmmaker-scientist-inventor had a decades-spanning career in which he created hundreds of short films on subjects ranging from astronomy to pigeons to, most famously, such marine-life marvels as the sea horse and the sea urchin. This definitive three-disc collection brings together the best of these, and also includes the French television series Jean Painlevé Through His Films, rock band Yo La Tengo’s eight-film score The Sounds of Science, and an essay by film scholar Scott MacDonald. Maybe the whale was disturbed by the ROV (remotely operated vehicle), or maybe it just wanted to see what it was up against. 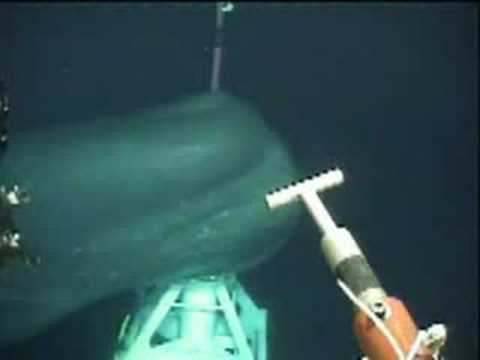 Roughly half way through the clip, you can see the tether (attaching the ROV to the surface ship above), on the whale’s back. Had the whale grabbed hold of the tether, things might have become dangerous. A night charter in Hawaii in search of manta rays was approached by a bottlenose dolphin caught up in a mess of fishing line. 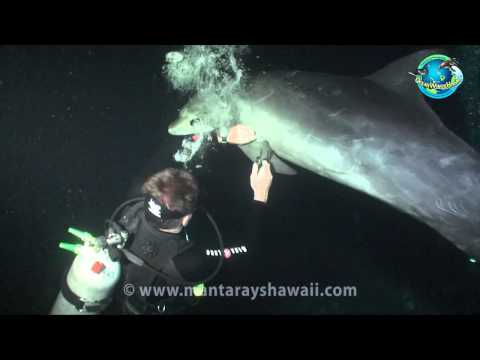 The dolphin dauntlessly swims up to a diver showing its fin, as if to ask for help. Keller Laros, the diver, begins to go to work on the entanglement, eventually finding it necessary to use a knife. The dolphin does its best to hold its position and remain balanced for the diver, only moving to return to the surface for air. Eventually, flipper is cut free and swims away.